We at the OuterHaven recently played the Online Demo for Mario Tennis Aces for Nintendo Switch. Since its first appearance, it appears that Camelot is on a mission to rectify the wrongs of the previous game Mario Tennis : Ultra Smash. The addition of a new mechanic, new characters, and upgraded visuals have made a bold impression at first glance. 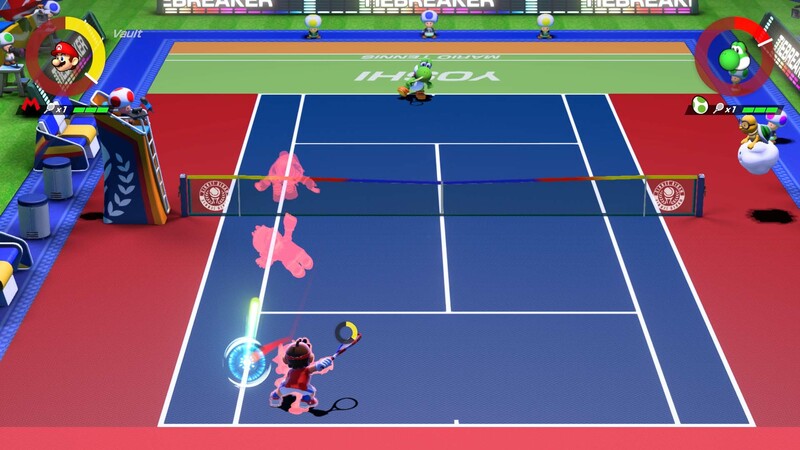 Now that two of us had time with it this weekend, we can tell you our thoughts and impressions on whether or not this entry will bring back the Mario Tennis game back to the spotlight. After earning 13 tournament wins and accumulating well over 20,000 points, it should show you how much time I’ve spent into this demo. The demo does a great job in teaching you the basics of the controls alongside showing the new features. The topspin, flat, slice, lob, and drop shots are in their usual fashion in tennis. Same thing with Charge Shots. Charge your shots, get more power in it. Nothing too complicated. The new feature, however, is the spotlight here. This time around, you have an energy meter. This plays an important role in matches. First, you need to charge you shots or volley the ball to fill up your energy meter. An advance technique that can bail you out of a tight situation and build meter is the Trick Shot. Depending on your character, you can perform this shot if your character is just in the right spot and distance from the balls anticipated path. Some characters’ trick shots can cover huge distance like Rosalina, Waluigi or Chain Chomp. Though you need to be careful, as you can overshoot the shot and miss it entirely. But if you land it with perfect timing, you build a lot of meter and get the advantage. Once you fill your meter to a third, you can do a couple of special things. First is the Zone Shot. When a star point appears on your side of the court, you must reach the point and press the R-button to then enter a first-person view. Here you can choose your spot to hit on your opponent’s side. Should you wish for pure accuracy on your shots or aim for body shots, this is a great feature. The second move is the Zone Speed. This is your defensive move. Should you think you can’t reach the ball in time, you can press R-Button to slow time ala bullet or witch time to help you reach it in time, or to help you block strong shots at the right time. Keep this in mind as it can really save you as I will explain later. Last is the Special Shot. You can use this once your meter is full. Press L to trigger it anytime the ball comes your way. You will do your character’s flashy special and puts into A first-person view again like the Zone Shot. However, this shot has an added perk of destroying your opponent’s racket if they don’t block it perfectly. Yes, your racket has Hitpoints. This is where the depth and bulk of the strategy comes into play. You not only have to outmaneuver and outsmart your opponent in regular tennis fashion, you also have to mind how much damage you can take with your racquet. Zone Shots will take one HP, while Special Shot can one shot it. You can block these shots and not take damage only if you block it right as the ball reaches you. Like A needle in front of your face perfect timing. You only have two racquets. Once all racquets are broken, you are KO ‘ed and automatically forfeit the match. So blocking perfectly is crucial. It really reminds me in terms of fighting games, in regards to your energy meter use. Do you use your meter or save it? Do I do my special now? So much depth presents itself here and I feel that is what Camelot specifically included to bring new life to Mario Tennis. More depth to an already complex game of tennis. This I welcome. From a graphical standpoint. it looks great. Not like Super Mario Odyssey beautiful but a nice sheen to the characters and the stadium. All while running at a smooth 60FPS via offline gameplay and if on a good connection in online matches. When you get a bad connection, however, the lag really shows and it will feel stiff that the button response will throw you off. Sometimes I get a match at 3 bar, but then suddenly drops to 1 bar, possibly ruining your streak or match. This is annoying when you are on match point and suddenly everything slows. Makes a person paranoid that the opponent did a lag switch. A nice little detail when playing the online tournament is when you reached the finals, two Toad commentators will introduce you and your opponent in ESPN fashion. This really brings out the character and the feel of a real tennis match up. They also commentate on the final match should you wish for it in the options menu. Another nice detail is your name appears on the banners and your side of the court. 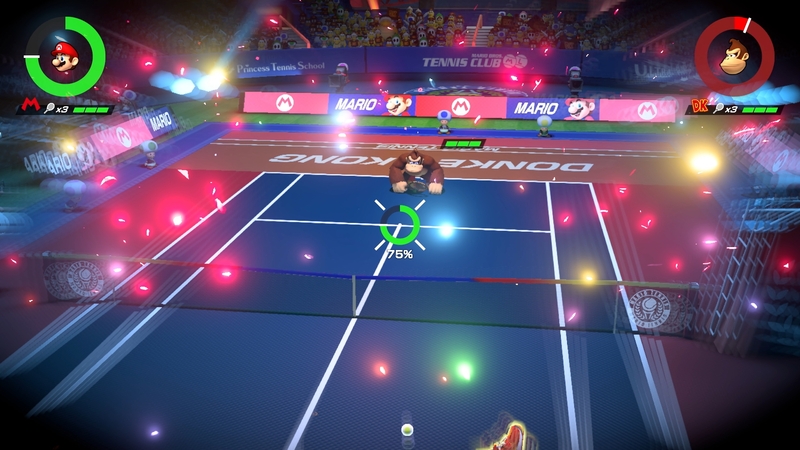 Aside from some lag matches, the demo for Mario Tennis Aces is just so much fun. The new energy meter and racquet management bring so much depth to the game. Who would’ve thought to incorporate meter specials ala fighting games and put it in tennis? 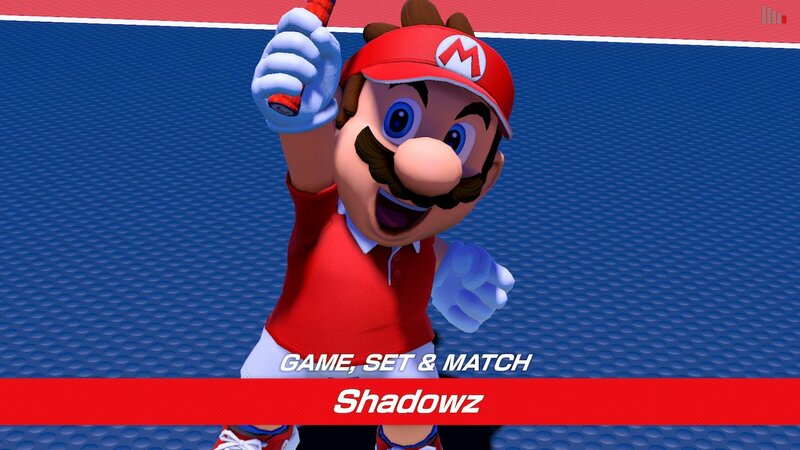 The looks and performance of the demo give me hope that confidence that this is the Mario Tennis game that everyone is waiting for. If they manage to improve the online service and performance, this may become a must buy for any Nintendo Switch owner. I had absolute fun with the demo and I will continue using my main Mario to bring me victory. Mario Tennis Aces has been on my radar since it was featured in January’s Nintendo Direct. Though inconsistent since the GameCube days, the Mario sports franchise has several classics in its catalogue. 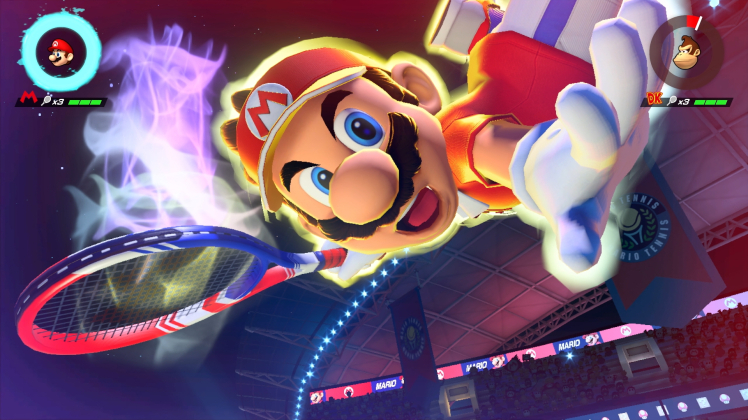 After playing 100+ matches this past weekend, Mario Tennis Aces seems poised to surpass Super Strikers as the best sports outing yet. 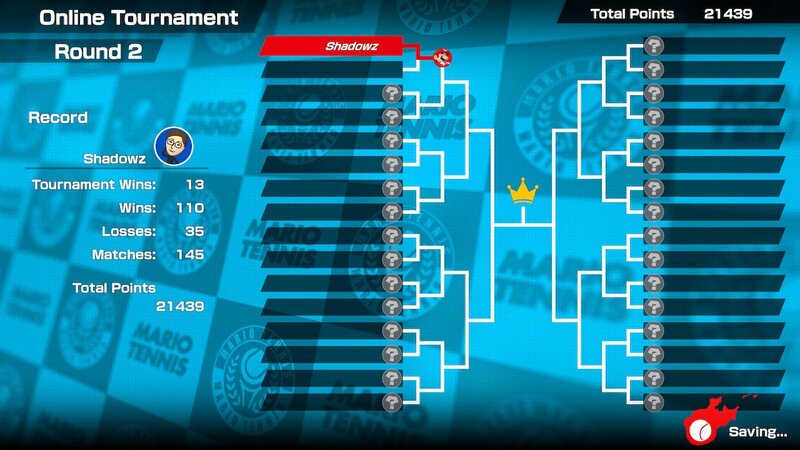 Competition summarizes Mario Tennis Aces better than any other word. 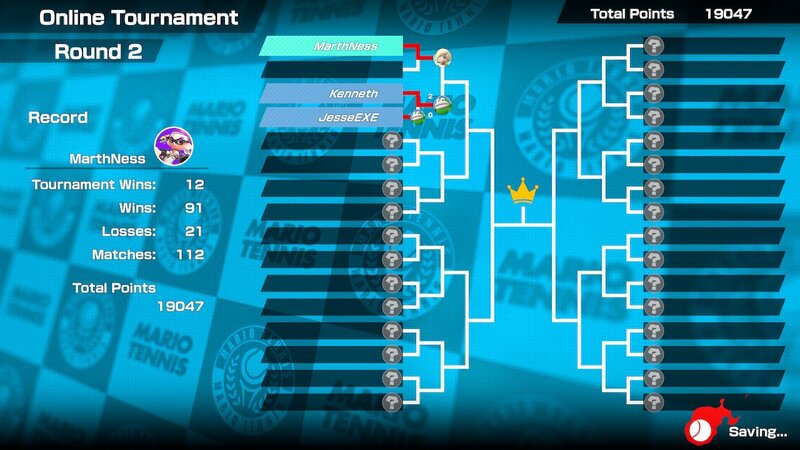 Nintendo’s plans for online tournaments when the full game launches remain to be seen, but Aces’s demo gave me a real sense of progress as I advanced through each round. Matches felt progressively tougher the closer I got to the championship showdown, and upon arriving I was greeted by a pitch-black arena, color commentary from two Toads, and a prematch cutscene introducing my foe and me. 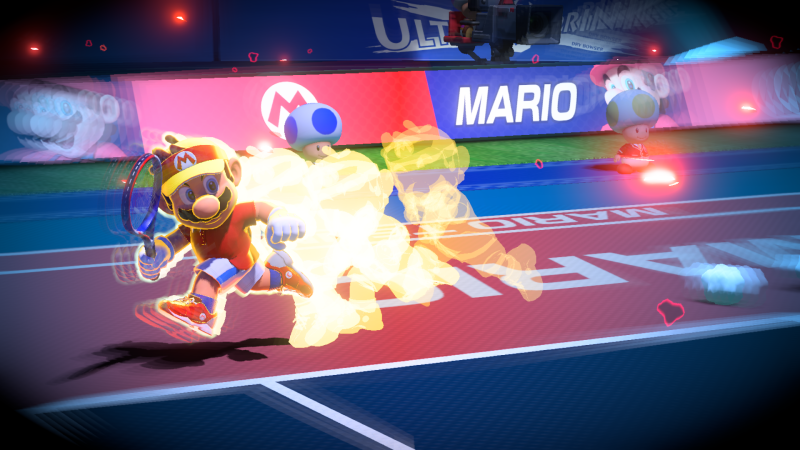 Even the Joy-Cons HD rumble adds to the tension, sending off an incredibly realistic heartbeat effect during “do-or-die” points. The presentation is top notch, but the shockingly deep mechanics take things to the next level. Developer Camelot scared more than a few fans with the announcement of Zone Shots and Zone Speed, but these are far from gimmicks. In fact, they separate Tennis Aces from every tennis game on the market. These abilities can only be activated when players have the requisite amount of power stored in their energy meter. Skilled players will quickly find themselves considering meter at every turn. Do you use your zone speed to try to claw back into a point, or do you let that ball pass and save up for a zone shot later? Check out this video for a glimpse! Pay attention to how Peach uses Zone Speed to get back into the point, and how Bowser capitalized on her empty meter with a Special Shot. Meter isn’t the only thing to manage either – rackets have a health bar and will break once it depletes! They’ll take damage when a player mistimes their swing on a zone or special shot. Special shots break racquets instantly, zone shots in three misses. It may sound like a cheap gimmick, but in practice, it opens the door for so many different playstyles. One particularly deadly strategy preys on people who struggle to block zone shots by using the zone shot on a serve. Without zone speed to counter, returners will quickly find their racket health depleting, forcing conservative play. Of course, you can keep your racket strong by swinging right when the ball reaches your character. These “blocks” can swing a match every bit as much as a racket-smashing Special Shot! If you played the demo or spent any time following it on Twitter, you’ve probably heard that Chain Chomp is too good. My opinion on the roster balance will certainly evolve as more courts get introduced and counterplay has more time to be developed, but in a game this competitive roster balance is imperative. Chain Chomp and Waluigi stand way above the rest of the cast on Marina Bay (I assume this game’s hard court), as they have an insane reach that allows them to get just about any ball. Chain Chomp’s natural power makes this gift especially deadly. Mashing Y and waiting for an opponent to make a mistake won me more than a few tournaments. Characters like Peach, Mario, and Bowser all feel well-balanced, with clear benefits and clear drawbacks. Unfortunately, Toad is entirely useless. He was by far the worst character in the demo. Unless some hidden benefit to him exists, I don’t see him ever being a strong pick regardless of the court. It’s natural for there to be a “worst character in the game”, but Camelot has made a game that is just so much fun to compete in. It’s a shame Toad fans won’t be able to use their favorite character to enjoy the game to the fullest as things stand. 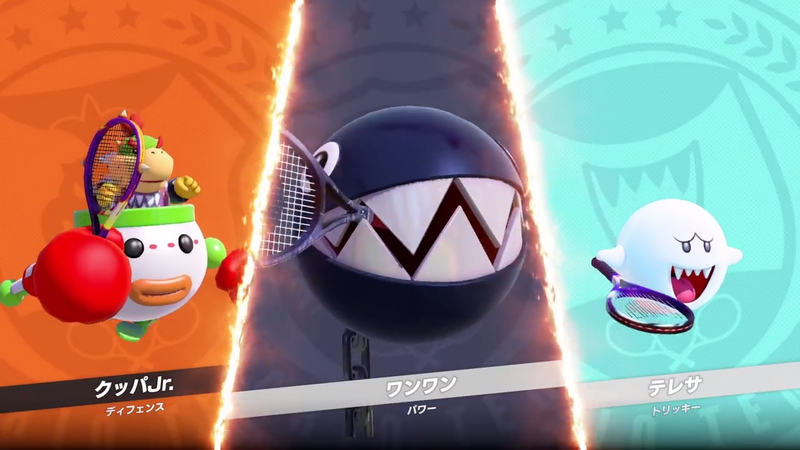 On the subject of the roster, Mario Tennis Aces does a fantastic job of incorporating some cool characters into the game. I don’t know who asked to see Spike play tennis, but I’m glad they did. With characters like Koopa and Diddy Kong coming via online tournaments, we should have a very complete final roster. It’s a shame Pauline or Cappy haven’t been confirmed yet though. Their absence feels odd in the Mario Odyssey era. 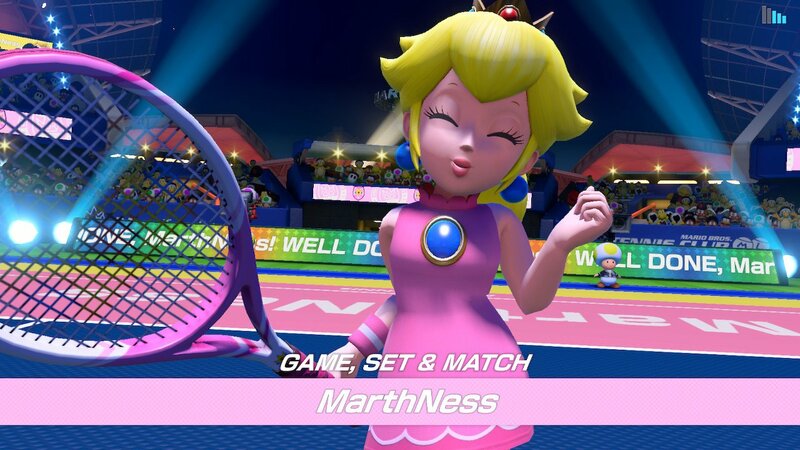 Mario Tennis Aces is really, really good. Truthfully, it feels a lot like a fighting game based on tennis mechanics. The game looks great both docked and in the handheld mode as well, its characters possessing great personality. Sad Yoshi broke the internet, and took me back to a time where I’d quickly turn off my N64 to make sure Baby Mario didn’t cry after a loss! A good blend of creative and standard courts will become available when the full game launches, as will more casual game modes. June 22 cannot come soon enough!